Entrepreneurs can have tunnel vision. VC herd mentality doesn’t produce results. Physics and thermodynamics are fairly important in energy applications. From 2005 to 2012, dozens of companies managed to extract hundreds of millions in cash from VCs in hopes of ultimately extracting fuel oil from algae. CEOs, entrepreneurs and investors were making huge claims about the promise of algae-based biofuels; the U.S. Department of Energy was also making big bets through its bioenergy technologies office; industry advocates claimed that commercial algae fuels were within near-term reach. Jim Lane of Biofuels Digest authored what was possibly history's least accurate market forecast, projecting that algal biofuel capacity would reach 1 billion gallons by 2014. In 2009, Solazyme promised competitively priced fuel from algae by 2012. Algenol planned to make 100 million gallons of ethanol annually in Mexico’s Sonoran Desert by the end of 2009 and 1 billion gallons by the end of 2012 at a production rate of 10,000 gallons per acre. PetroSun looked to develop an algae farm network of 1,100 acres of saltwater ponds that could produce 4.4 million gallons of algal oil and 110 million pounds of biomass per year. Nothing close to 1 billion (or even 1 million) gallons has yet been achieved -- nor has competitive pricing. Today, the few surviving algae companies have had no choice but to adopt new business plans that focus on the more expensive algae byproducts such as cosmetic supplements, nutraceuticals, pet food additives, animal feed, pigments and specialty oils. The rest have gone bankrupt or moved on to other markets. The promise of algae is tantalizing. Some algal species contain up to 40 percent lipids by weight, a figure that could be boosted further through selective breeding and genetic modification. That basic lipid can be converted into diesel, synthetic petroleum, butanol or industrial chemicals. According to some sources, an acre of algae could yield 5,000 to 10,000 gallons of oil a year, making algae far more productive than soy (50 gallons per acre), rapeseed (110 to 145 gallons), jatropha (175 gallons), palm (650 gallons), or cellulosic ethanol from poplars (2,700 gallons). The question is: Can algae be economically cultivated and commercially scaled to make a material contribution to humanity's liquid fuel needs? Can biofuels from algae compete on price with fossil-derived petroleum? Once capital needs, water availability, energy balance, growing, collecting, drying, and algae's pickiness about light and CO2 are factored in -- the answer, so far, is an emphatic no. Here's a list, by no means complete, of algae companies attempting to pivot away from biofuels. Algae Floating Systems is "temporarily shifting its focus away from fuel to nutraceutical and animal feed markets." Algenol intended to use nitrogen-fixing blue-green algae (cyanobacteria) in photobioreactors to produce ethanol directly. With tens of millions of dollars in public money and hundreds of millions in private-sector investment, Algenol once claimed its technology "enables the production of the four most important fuels (ethanol, gasoline, jet, and diesel fuel) for around $1.30 per gallon each using proprietary algae, sunlight, carbon dioxide and saltwater at production levels of 8,000 total gallons of liquid fuel per acre per year." In 2015, the firm fired its CEO and shifted its focus to carbon capture and nutraceuticals. Algae Tec: An Australian PBR penny stock company with algae oil and algae byproduct dreams. Algix develops fish farms and algae harvest equipment. AlgaeLink was a sketchy retailer of photobioreactors and commercial algae cultivation equipment. Alga Technologies grows algae in closed bioreactors to harvest astaxanthin in Israel’s Arava desert. Aquaflow Bionomics once intended to produce biofuel from wild algae harvested from open-air environments. The company is now a biofuel site developer called NXT Fuels. Aurora Biofuels: Aurora moved from fuel to food with its genetically modified algae in 2011. The firm went bankrupt in 2015 after winning more than $23 million from Oak, Noventi Ventures and Gabriel Venture Partners. Cellana and its Hawaii-based algae feedstock production system received DOE funding to boost algae productivity as a way to reduce cost. The firm produces DHA and omega-3 EPA and DHA oils, animal feed/food, and biofuel feedstocks. Global Algae Innovations is exploring algal biofuels at a 3.2-acre algae farm co-located with a power plant in Hawaii. The firm has received $11 million from the U.S. DOE. GreenFuel Technologies, long bankrupt, was backed with more than $27 million in funding from Polaris Ventures, Draper Fisher Jurvetson and Access Private Equity. Heliae raised $80 million from two $20 billion food conglomerates in 2016, and has spent years developing a "platform technology" to produce nutraceuticals, personal care products and perhaps fuel through a mixture of phototrophic and fermentation processes. LiveFuels received $10 million in funding from The Quercus Trust in 2007. Lissa Morgentahler-Jones and David Jones are still listed as officers of the firm on LinkedIn. OriginOil is now OriginClear and has shifted to water decontamination. PetroAlgae changed its name to Parabel as it shifted from fuel to foods in 2012. Phycal received significant DOE funding to design a high-yield algae farm and biorefinery in Hawaii. Pond Technologies is cultivating algae for carbon capture and nutraceuticals. 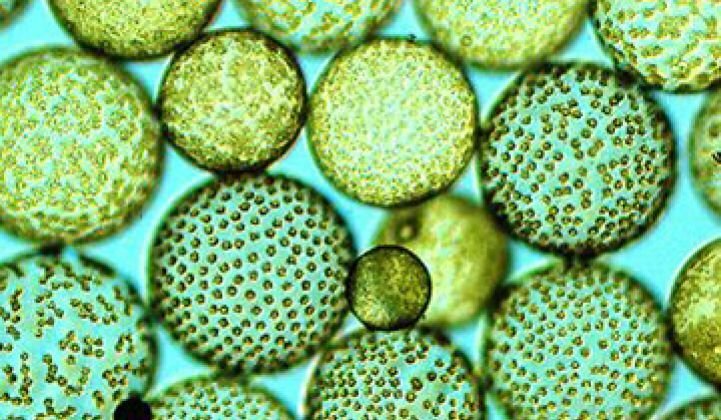 Renewable Algal Energy is a microalgae products company that received DOE funding to prove out its algal oil harvesting and extraction technologies. Sapphire Energy produces omega-3 oils and animal feed ingredients. Sapphire raised more than $100 million from Bill Gates’ Cascade Investments and ARCH Venture Partners. Seambiotic uses raceway/paddle-wheel open pond algae cultivation. According to Israel 21C, Seambiotic "recently launched a commercial algae farm in China" to produce a "valuable nutraceutical food additive." Solix, once a well-funded algae fuel aspirant, repositioned itself as an astaxanthin, DHA, and omega-3 supplier. Synthetic Genomics, founded by Craig Venter and ExxonMobil, announced earlier this year that it has extended its agreement on joint research into advanced algae biofuels "after making significant progress in understanding algae genetics, growth characteristics and increasing oil production." TerraVia (formerly Solazyme) shifted from supplying fuels to oils, algal flour and proteins with a heterotrophic process that ferments genetically modified algae fed sugars. XL Renewables developed algal production systems using dairy waste streams, then changed its name to to Phyco Biosciences and went out of business. This extensive list highlights the immaturity of both the biofuels market and the VC investment community -- at least when it comes to energy. Is there a pony somewhere in this pile of BS? So is there some lesson here other than that disrupting the global fossil fuel market is not for the fainthearted and entrepreneurs are irrationally optimistic? The scope of the algae to large-scale liquid fuel effort is more along the lines of the Manhattan Project or the Apollo moon shot, which cost $24 billion and $360 billion, respectively. A $25 million Aquatic Species Program, a $100 million DOE program, or $300 million in venture capital will not get it done. It will take tens of billions of dollars and decades of research and work. There are many pieces to the algae puzzle that seem like afterthoughts, but which are actually crucial to the economics -- co-products, nutrients, harvesting, drying and conversion technology. System design and algae type (which seem to be the focus of most discussions) are important, but not the only components. Considering the immense technical risks and daunting capital costs of building an algae fuel company, it doesn’t seem like a reasonable venture capital play. And most -- if not all -- of the VCs I’ve spoken with categorize these investments as the longer-term, long-shot bets in their portfolio. But given the size of the liquid fuels market, measured in trillions of dollars, not the customary billions of dollars, it makes some sense to occasionally take the low-percentage shot. There is incredible potential for algae technology in drug discovery and production, specialty oils and a range of chemicals. Will we be running commercial engines on algae-derived fuels in the 21st century?